a. Applicant must Bangladeshi citizen can appy. b. SSC/Equivalent passing year 2014 or 2015 in science group. Every interested student can apply for Jatiya Kabi Kazi Nazrul Islam University (JKKNIU), Mymensingh via Teletalk Mobile Operator below instruction. Reply: Applicant’s Name, Unit Registration Fee will be charged as application fee. Your PIN is (8 digit number). This PIN number note. Reply: Congratulations! Applicant’s Name, payment completed successfully for Jatiya Kabi Kazi Nazrul Islam University (JKKNIU). User ID is (xxxxxxxx) and Password (xxxxxxxx). Please note this User ID and Password. 9. JKKNIU Admit Card Download: KNU authority will published Admit card download time and date their official website www.jkkniu.edu.bd. a. Go to www.jkkniu.edu.bd and Input your User ID and Password. d. Attached two copy applicant passport size color photograph in place. Jatiya Kabi Kazi Nazrul Islam University (JKKNIU), Mymensingh Admission Examination Center and Test Seat Plan will publish JKKNIU official website www.jkkniu.edu.bd and SMS by applicant mobile. Jatiya Kabi Kazi Nazrul Islam University (JKKNIU), Mymensingh admission result publish as soon as on www.jkkniu.edu.bd and SMS by applicant mobile. 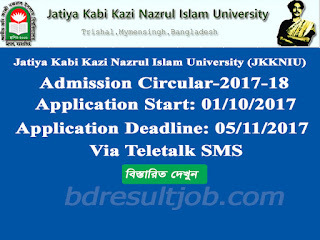 Tags: www jkkniu edu bd admission, Jatiya Kabi Kazi Nazrul Islam University (JKKNIU), Mymensingh Admission circular 2017-2018, Jatiya Kabi Kazi Nazrul Islam University (JKKNIU), Jatiya Kabi Kazi Nazrul Islam University (JKKNIU), Mymensingh Admit card download, Jatiya Kabi Kazi Nazrul Islam University (JKKNIU), Mymensingh seat plan 2017, Jatiya Kabi Kazi Nazrul Islam University (JKKNIU), Mymensingh test mark distribuition 2017. 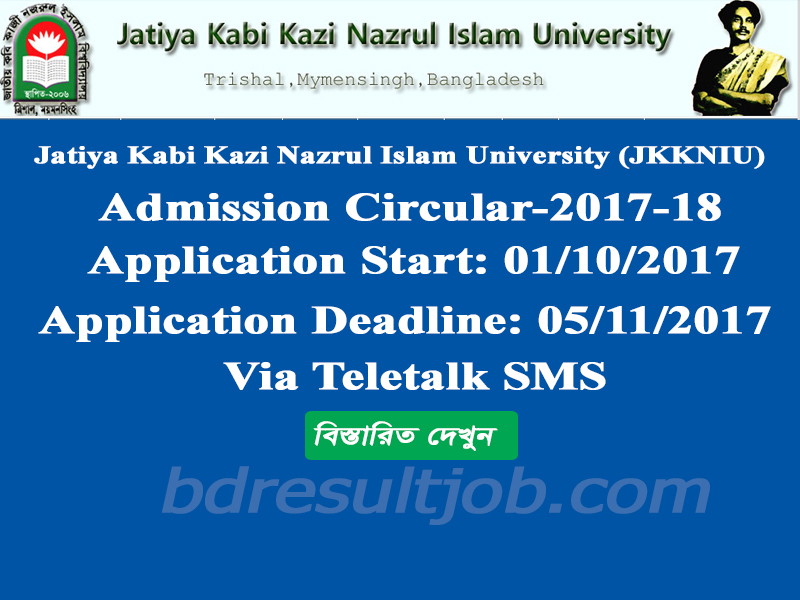 Jatiya Kabi Kazi Nazrul Islam University (JKKNIU), Mymensingh Admission Circular 2017-18, Jatiya Kabi Kazi Nazrul Islam University (JKKNIU), Mymensingh Admission test seat plan 2017, Jatiya Kabi Kazi Nazrul Islam University (JKKNIU), Mymensingh test mark distribuition 2017.